Click images for large view in new window. 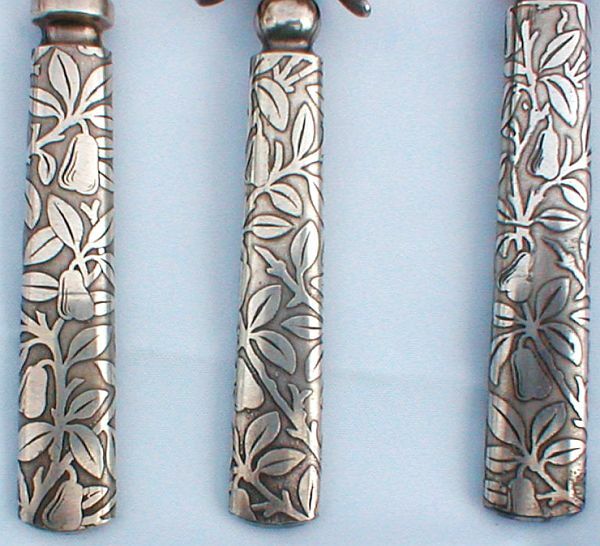 Solid metal handles with embossed (raised) pears and leaves design. Steel blade stamped 1847 ROGERS BROS. This set was made anywhere from the year 1882 until production ceased in the early part of the 20th century. It is part of the multi-motif floral pattern series EMBOSSED by Rogers Bros. considered rare in today's market. *The steel blade has garnered some scratches within the past 130 years or so but is still very sharp. Reg. $75.00.